Silly Bandz: When Will the Fast-Moving Fad End? If you're tired of your daughter telling you that she just has to have the Princess pack of Silly Bandz, never fear. The end of the begging -- and the Silly Bandz craze -- is near. Or at least that's what some toy industry experts predict. In case you are one of the few that hasn't heard of them, Silly Bandz are brightly-colored bands that can be worn around the wrist like bangles, but return to their shape -- unicorns, crabs, sailboats, baseball players, geckos, circus tents, etc. -- once removed. This is the first huge hit for Silly Bandz creator Robert Croak, a longtime toy inventor. Annual sales have exploded from $10,000 two years ago to "north of $100 million," according to USA Today. The Silly Bandz phenomenon has all the hallmarks of a true fad. The company has spawned copycats with all-too-similar names, such as Logo Bandz, Crazy Bands and Zanybandz and comparisons have been made to knockoffs of the Beanie Babies fad of yore (and Webkinz, to keep things current). Tim Walsh, a toy inventor and author who was recently featured in the documentary Toyland, compares the ubiquity of knockoffs to the early days of the Hula Hoop. "It made it tough for the fad to stick around," he said. "It was just a plastic hoop." Every fad also needs celebrity endorsements, and this one has Sarah Jessica Parker and Mary-Kate Olsen, who have both been spotted wearing the rubber bracelets. "We always thought they'd be a great fashion accessory for all ages," says Croak. A fad also entails meteoric growth. Brain Child Products Imports has grown from 20 U.S. employees in 2009 to 200 today, and now 3,000 workers in China are manufacturing millions of the bracelets. And despite a buyout offer of $10 million, Croak says: "This is way too much fun for me to take the money and run." Sold in packs of 24 for $4.95, part of the appeal is the price. Like other products with lasting interest for children -- Pokemon cards come to mind -- they're great for trading, collecting, and sharing. It's hard to resist a child's insistence that she buy a pack to share with her sister (I'm projecting here, I have little boys who have yet to discover Silly Bandz). A Twitter follower tells me, "my daughter and son both like them, plus they're cheap so [it's] no big deal when lost or broken." Mothers report that the Silly Bandz came into their children's lives mysteriously. "I don't even know where she got them!" says Olivia Rebanal of her daughter, Philly, who one day was sporting an armful. On a mother-daughter trip to San Diego, the nine-year-old was pointing out Silly Bandz on teens and 'tweens. "See, I told you they're really popular," she told her mom. New York creative director Liz Gumbinner told me her daughter Thalia thinks Silly Bandz "is the Second Coming," adding, "We had to limit how many she could wear at a time." Other than overloading one's arms, the trend seems harmless enough. And like fads of the past, schools have banned them. 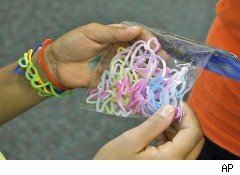 In Florida, Massachusetts, New York and Texas, school principals and districts have sent home letters asking children to leave the Silly Bandz at home. "It's a distraction," a fourth-grade teacher told Time magazine. Like Pokemon cards (banned from my own children's classrooms), kids trade them or just gaze jealously at other students' arms instead of listening to the teacher. Other schools have banned them because of safety concerns (wearing the bands around the neck, for instance, or using them like the ordinary rubber bands kids have been shooting at other kids and teachers forever). One principal, fed up with fights following trades gone bad, banned them except for monthly Silly Bandz days. I asked Walsh, is this a fad or something that will last longer? He brings up the example of Hula Hoops again; Wham-O's simple plastic hoop was launched in January of 1958, and the company was manufacturing -- and selling -- 20,000 a week. By October of 1958, the trend was over. Gone. And the company was sitting on hundreds of thousands of unsold hoops. Likewise, the Rubik's Cube sold 100 million cubes from its launch in 1980 to the end of 1982, and then knockoffs flooded the market. But while those suffered a huge decline in sales after the initial craze, they've recovered, and are still best-loved toys with serious brand equity. Why? "Novelty," says Walsh. The products that successfully translate from craze to sentimental favorite do something that's never been done before. He doesn't think Silly Bandz has it; the product's history isn't marked by a unique invention or unusual application of product mystique, as in the Cabbage Patch Kids -- "they weren't called 'dolls,' they were called 'kids'; and you didn't buy them, you 'adopted' them," says Walsh. "There's nothing novel about Silly Bandz, nothing to make it last, unless they give kids something fresh or new." And "fresh" and "new" is what BCP Imports is now chasing. Lest customers get bored with the same-old 24-packs, the company has just released color-change Silly Bandz that are activated by sunlight, "glitter and glow" packs that glow in the dark, and Silly Necklaces, on which you may string your Silly Bandz to "proudly display them around your neck." The company has big plans for Fall 2010 -- Silly Pails, a $19.95 lunchbox with 72 Silly Bandz inside. The product, says Walsh, will have to keep stretching and extending itself. The company's management is uncharacteristically philosophical about the trend's life cycle, which Croak estimates to have five more years. He's sold his house and moved into a loft in his company's Toledo, Ohio, headquarters. He told USA Today the journey has been "surreal" and that, even when the craze ends, he'll still believe "I'm the luckiest guy in the world." His fans feel lucky, too, writing him letters, Tweeting and Facebook-ing their joy, even posting long, involved stories about their child's infatuation on their blogs. One mom tells of how her child gave her one of his first 24-pack, and now, "every time I look at my wrist I can't help but feel really loved by my 6-year-old son." Could these be the fraternity pin of the next generation? They're being purchased by college bookstores. They're positioned as an impulse buy at 7-Eleven outlets -- right next to the herbal energy packets and the cigarette lighters. They're symbols of love. As good as cupcakes! I give them six months. Walsh, making his judgment based on 20 years of toy inventing and writing books on the industry, came up with the same amount of time. Still, he says, it's been a good run; when I say the CEO comes off as a bit brash, Walsh says he has a right to: "$100 million in rubber bands in the shape of animals is pretty amazing."